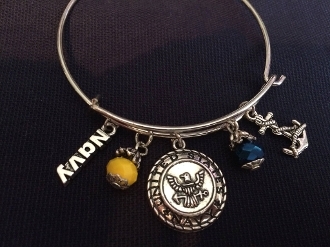 Silver toned Charm Bracelet with the official Navy colors; Navy and Yellow/Gold jewel charms, United States Navy Crest charm, NAVY Charm, and an anchor charm. If you want you can change the "NAVY" charm to a "NAVY MOM" Charm. This piece is beautiful and is great for anyone with a loved one in Navy or even for our female sailors. The pictures do not do the jewelry items justice. This item has FREE First Class Shipping!